The last thing I remembered. Leave it to Mr. Aidan Demarest to go out with a bang. Last night was his grand finale as director of beverages for Hollywood Roosevelt’s Spare Room. And it also happened to be Tiki Night featuring the cocktail stylings of the very talented Marcos Tello (The Varnish) and John Lermayer (The Florida Room, South Beach). Coincidence? I think not. Naturally, cocktail geeks like Thirsty in LA, EstarLA , LaurenTheClark and Social Domain LA as well as liquor industry folks like bartender Zahra Bates and Plymouth Gin brand ambassador Silamith Weir turned out in full force for the event to wish Aidan good luck in his new venture, Neat bar in Glendale, as well as to marinate in the tiki concoctions of the evening. 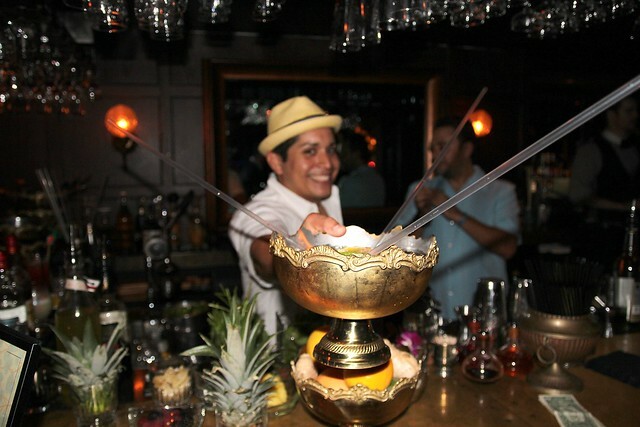 Many, many bowls of Marcos’ flaming Kraken-Toa Bowls made the rounds in the room causing innocent by-standers to duck the cocktail’s long spear-like straws. A favorite of the evening was John’s One of the Hammock, a very light, frothy cocktail which was a welcome respite from the heavier, sugary tiki drinks. To me it came across as a mint frappe…even though it didn’t have mint in it but coconut rum, Domain de Canton, absinthe, pineapple leaves and sage leaves. In any case, last night was a blast. Here’s to many more parties at the Spare Room under the new leadership of new Director of Beverages Naomi Schimek!